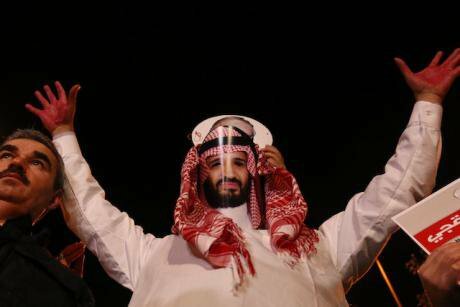 Man wearing a mask depicting Saudi Crown Prince Mohammed bin Salman protests the killing of Saudi journalist Jamal Khashoggi, during a candlelight vigil outside Saudi Arabia's consulate in Istanbul, Turkey, Thursday October 25, 2018. Picture by Depo Photos/ABACAPRESS.COM. All rights reserved.The Saudi reaction to the murder of Jamal Khashoggi seems, repeatedly, to defy reality. The monarchy initially rejected all responsibility. When evidence leaked by Turkish investigators became overwhelming, they changed the story to suggest a surprise physical altercation was followed by accidental death. They then acknowledged that Saudi operatives were behind the killing, but claimed it had been a rogue operation. All three versions are widely seen to lack credibility. Is this just a case of bad PR? Part of the answer is that Muhammad bin Salman, the crown prince of Saudi Arabia, seems to have been genuinely surprised at the vehement reaction to the murder. Being caught off guard, however, is not the only probable reason for Riyadh’s doubling down. Once the regime denied responsibility for the crime, repeating the official story – however incredible – became a loyalty test for Saudi citizens. This is the argument put forward by Laleh Khalili, a professor in Middle Eastern politics at SOAS in London. She suggested that it is Riyadh’s way of practicing politics of “as if”. This is an idea that the scholar Lisa Wedeen first developed in the context of Syria and the personality cult that once surrounded Hafiz al-Assad, president Bashar al-Assad’s father. After seizing power in 1970, Hafiz al-Assad forced Syrians to parrot increasingly absurd claims. As a result, he was not only unceasingly said to be the beloved father of the nation, but also the nation’s “premier” pharmacist, lawyer, or doctor. The purpose of these absurd claims was not to achieve ideological legitimacy by offering a plausible interpretation of reality. It was, Wedeen argued, to demonstrate the power of the regime by forcing people to repeat a party line that was patently untrue. A similar dynamic seems to be at play in Riyadh. A recent English-language comment piece in the Saudi Gazette was symptomatic. It appeared on 18 October, when Riyadh was still vehemently asserting its innocence. The article asserted that the disappearance of Jamal Khashoggi was “nothing but a comedy act” that was “orchestrated by haters and ill-wishers in Qatar” – Saudi Arabia’s Gulf rival. Doha’s malicious ruse would soon be exposed and Saudi Arabia would triumph. There was also “a group that is playing a dangerous role in the dark” – an oblique reference to Saudis who were doubting the official version “by spreading rumors and circulating fake news among Saudis in an effort to make them doubt their government”. The comment piece clearly set out what was expected of Saudi subjects. Anyone who publicly doubted the official version of events was a “parasite” to be targeted in an “in-house cleaning”. Meanwhile the Saudi regime reportedly unleashed a troll army to stifle dissent on social media and target online activists. The Saudi Gazette article has to be understood as a warning to the population: play along with the politics of “as if” or face the consequences. A second example of Riyadh’s brazen manoeuvring was a photo-op of the king and his son the crown prince offering their condolences to Khashoggi’s son on 24 October. In the photos the young Khashoggi appears stone faced, and he reportedly left the country soon after the photos were publicised. As Elizabeth Tsurkov at the Forum for Regional Thinking pointed out, the meeting echoed a similar encounter 30 years ago between Hafiz al-Assad and the Lebanese Druze leader Walid Joumblatt, in the context of the Lebanese civil war. This meeting took place a few weeks after Joumblatt’s father had been assassinated, likely on the order of Hafiz al-Assad. It was a performance designed for public consumption. It was to show the son’s fealty to the ruler. This is why the son had to shake the Syrian dictator’s hand, acting “as if” Assad really was just another concerned foreign dignitary. Muhammad bin Salman has courted foreign investors to end the country’s oil dependence and brought social reforms to the conservative kingdom. He lifted the ban on women driving and on modern entertainment options such as cinemas and music concerts. This softening of the monarchy’s image masked a brutal crackdown on dissent. In 2017, bin Salman imprisoned dozens of tycoons so as to discipline Saudi economic elites. His security services filled the country’s prisons by persecuting Shia activists, influential clerics, and women’s rights activists. Controlling public discourse through the politics “as if” is part of the repertoire of the new Saudi authoritarianism. Muhammad bin Salman is not defying reality, he is forcing Saudis to defy it as proof of their loyalty. Seen this way, the alternative reality that Riyadh constructs is not so much a sign that it is losing control, but that the crown prince is tightening the reins.